Where can the whole family have fun for FREE? This answer is Larkspur! Yes, the Larkspur Chamber of Commerce is holding the 2014 Larkspur Autumn Harvest and Craft Fest at the beautiful Larkspur Community Park. This annual event has grown into a really stellar affair …replete with history, crafts, music, food, drink, games and, yes, a pie contest. Literally, you will find this event well worth your while. 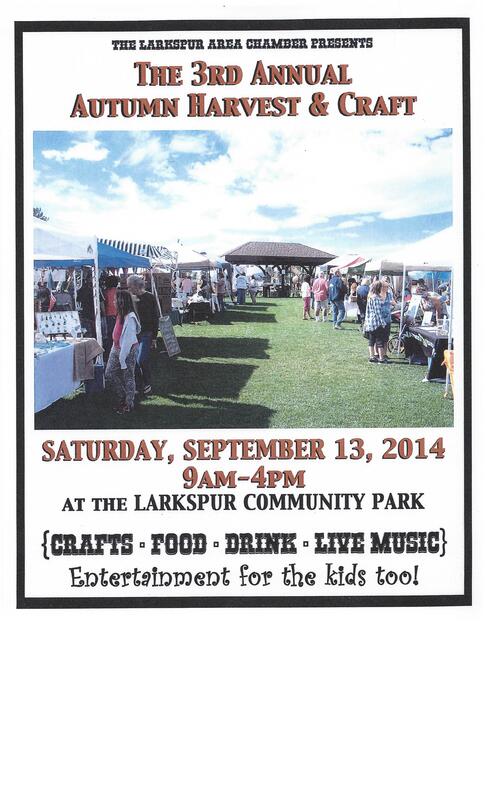 Larkspur Historical Society will be there with Larkspur area history and John Hultman’s amazing guns. Oh yes, don’t forget the pie contest if you want to test your baking skills. For details and entry registration, click on Pie Contest . Larkspur, sometime thought of as just a small country town, does their events up right in a big way! You’ll have fun and likely want to make sure that you attend this event again next year!